Includes an energizer controller that shows all fence performance information (e.g. voltage, faults and location). A very powerful 110v electric fence energizer used to keep in cattle, sheep, goats, horses, poultry and guard dogs. Effective at protecting against coyotes, stray dogs, bear and fox as well. Can be placed up to 160' away from the energizer via an RJ-12 computer cable (10ft is included with purchase). This reliable and energy efficient Energizer provides incredible fence performance regardless of extreme temperature conditions or unreliable power supply - adjusting power output to suit your fence conditions and minimize power consumption. Energy efficient – adjusts its power output to suit your fence conditions and minimize power consumption. Quick scan LED fence performance lights: green light shows fence ok, red light flashes if there’s a fence fault and solid red light shows sudden increase in fence load. Easy installation and good connection using split bolt recessed terminals. User safety and reliable animal control with in-built lightning and short circuit protection. Better fence management with output, ground and fence voltage alarms. Item #119023 - While supplies last! Accurately measure electric fence voltage and current. Also pinpoints faults within the fence line. Item #119024 - While supplies last! 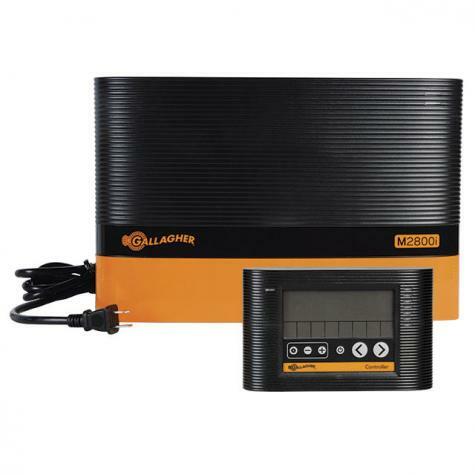 ​Create a watchful eye by monitoring all corners of your fence with Gallagher's i Series Fence Monitor​.